Garlic butter and parmesan cheese mashed potatoes are soft inside and crispy on the outside. Delicious indulgence, they are drowned in garlic butter and melted Parmesan cheese! They taste like pure joy, it's that simple! They are an excellent side dish for many main dishes, whether these contain meat or are vegetarian. This can also be a meal in itself. Sit in front of the TV with a tray of these delicious potatoes and dip them in tomato sauce or sour cream. Delicious! This recipe gives 8 servings. NOTE: You can replace parsley with rosemary or thyme, or add them all. You can also add lemony flavor and oregano. Or, add bacon and the cheese of your choice. Let your creativity run wild! Preheat the oven for broiling over medium-high heat (about 200°C | 400°F). Place the potatoes in a large pot of salted water and bring to a boil. Cook uncovered for 30 to 35 minutes or until potatoes are tender when a fork is inserted. Drain well. Lightly grease a large baking sheet or baking dish with a cooking oil spray. Arrange the potatoes on the sheet and use a potato masher to flatten them slightly into just one piece (not too hard or they will be crushed). Mix the butter, garlic and parsley. Pour this mixture over each potato. Sprinkle with salt and pepper and drizzle with olive oil. Grill until potatoes are golden and crisp (about 10-15 minutes). 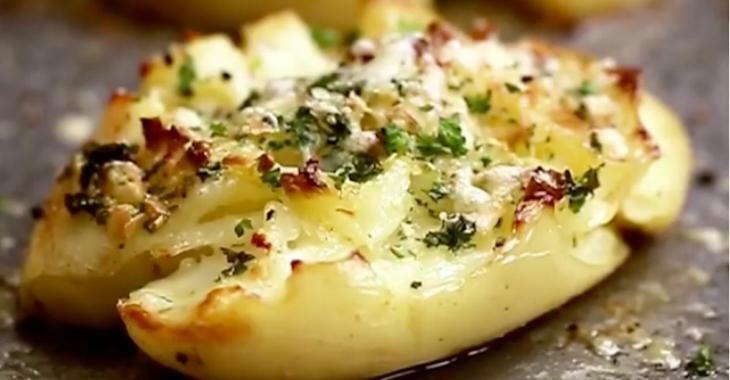 Remove from oven, sprinkle with parmesan and return to oven until cheese is melted. Season with a little salt and parsley and serve immediately.